How to get best out of your homeopath? To get the best out of a homeopath one should know first how to select an efficient homeopath. One should look for the following virtues in a homeopath. A good homeopath must have studied homeopathy from a reputed and recognized school of homeopathy for at least five and a half years. She or he should have a good medical knowledge. He should have adequate knowledge of the disease that you as a patient are suffering from. He should have knowledge of conventional medicines which are prescribed to you by the conventional doctors. For instance, for Psoriatic Arthritis Methotrexate is given, for Ulcerative Colitis Salazopyrine is given, for Asthma various bronchodilators are given. What things should a patient follow to get the best from a homeopath? Patient has to follow a few things in order to get the maximum benefits from his treating doctor. Give proper history: It is the duty of the patient to give a proper and detailed history about the disease condition he is suffering to the treating homeopath. Many patients do not give history at length. They find this process of history giving very long and tedious. But, a good history will follow a proper prescription. This is true especially when you want to take homeopathy treatment. Provide the correct information: Give correct information about the disease you are suffering from, history about yourself, history about your family in terms of any genetic disorders and interpersonal relations between you and your family members etc. Homeopathy is a science which gives a lot of importance on the emotions and mental frame of the patient and its direct relation with the formation of disease in the body. So, it is very important for patients to reveal every information correctly when is asked by the doctor during case taking. 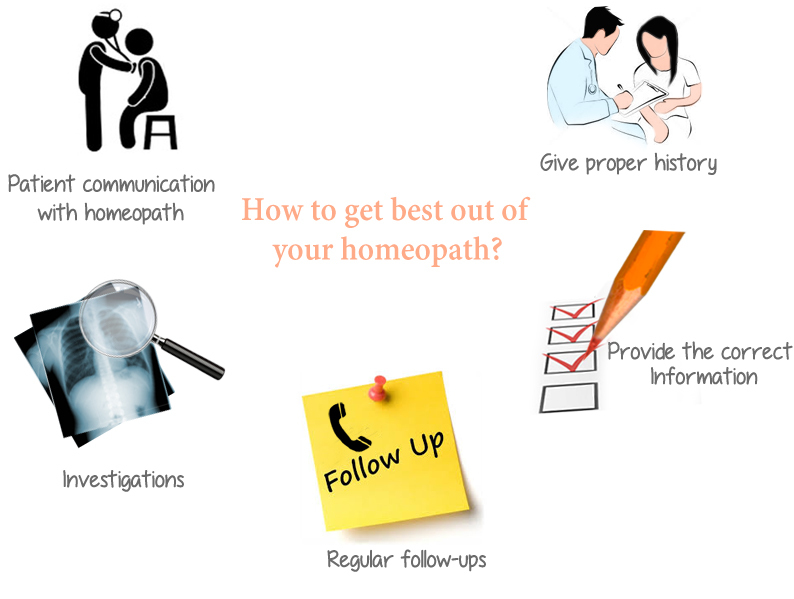 Regular follow-ups: Report to your homeopath when you are called for the follow up. In order to get the best results, the patient has to make regular follow up visits at the doctor’s clinic. Some patients are very enthusiastic and regular with their follow-ups initially. Gradually, this enthusiasm fades away as the time passes and they start missing the follow ups and become irregular with medicines and treatment. This practice should be avoided in order to get treated well. Investigations: You, as a patient should make sure whether your disease is monitored properly or not. The monitoring of disease can be done by conducting regular tests like blood tests, X-Rays, sonography etc. Your disease condition should feel better and not just you: Patient should analyze his case and improvement level when he is under the treatment of the homeopath. He should try to find out that by how many percentage his disease has improved after starting treatment under the homeopath. Patient should keep communication lines open between his homeopath and allopath: This is true especially, when he is treated for a chronic condition and there is a fear of sudden exacerbation of the disease. Ex. Bronchial Asthma, taking palliative treatment for a few types of cancers etc. When a homeopath is treating such conditions he can be in touch with the allopathic doctor and take his help when the severity of the disease is more. This practice makes the patient more confident. He feels he is in the safe hands. Thus, he is treated in a better way. These are the few tips to get the best out of your homeopath.